I have quoted in the past articles from the INFOFISH Magazine (you should subscribe if you can), written by colleagues/friends about their work. This time is a bit unusual as will be quoting one that was written by my friend Vibeke Brethouwer, whom interestingly, I been married with for the last 18 years! The unusual element about this, is that she does not really work in fisheries, she is a graphic designer and mediator. Just to give context, over the years learned that when you work in compliance, is not just about fisheries rules… is mostly about conflict in between people holding two very different position over one topic. 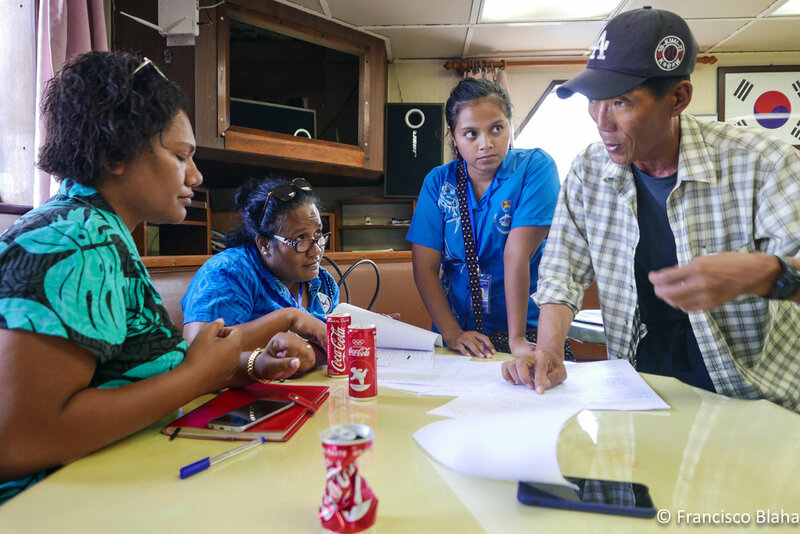 Furthermore it get intensified by the fact that in the commercial fisheries sector in the pacific, that conflict takes on the substantial cultural differences en between industry (mostly people from DWFNs) and regulators from Pacific Islands. Just look at the body language in the pictures that illustrate this blog entry, if you have doubt about this reality. I discussed this with my colleague, friend and almost brother Ratu Jope Tamani from FFA many times and we agreed that knowing how to deal with conflict is fundamental to the job, and that all the training we do need to involve this fundamental aspect of the job as part of the curriculum, so we decided to that. So Jope said: “Vibeke would be great to do this training; she has the qualifications and experience in conflict resolution, has lived with you in various countries in the world with along my fisheries work, which gives her multicultural / fisheries context, and surely is good at managing conflict since she been married to a melt pot of nationalities and hard headed ex-fisherman like you for long time while bringing up your lovely kids! !” So yea… that kind of settled it. I have been to one of her 1 day sessions as part of a 3 week trainings and it was quite something! Way more participative and mobilising that any other session we had, it touches deep nerves about human interactions that are the basis of the jobs we do. And I find it incredible that none of the fisheries inspectors or observers trainings i been involved for most of my life, do include a session of conflict management as vital part of the curriculum. Hopefully this initiative helps changing that. I have worked with the FFA in the past three years to provide a one-day workshop on ‘Managing Conflict and Challenging Conversations’ during their yearly Regional Competent Authority Fish Inspection training in Fiji. Conflict resolution and fish inspection may seem like unrelated subjects but it turns out that talking about conflict and how to address the thorny issues that come up in the work of fisheries inspectors is a great way to help people become more confident and compassionate leaders in their workplaces, and this of course then benefits everyone involved. At the start of the workshops, I often begin by defining conflict, a word that can be a little scary. It is important to note that conflict is not necessarily violence, but that violence is simply one of the ways in which humans (and animals) deal with conflict, and mostly not in a very productive way. Conflict is simply any situation in which your concerns and desires differ from those of another person, or stem from a disagreement between two or more people. We also immediately realise that conflict is possible within our own selves, as we have opposing desires or concerns in life on a daily basis. Conflict is not necessarily a bad thing (nor a good thing), it simply is a fact of life. This broad definition of conflict allows us to consider how it is that we try to avoid certain conflicts, but other types of conflict, we relish and we enjoy. Sports games are a type of conflict, where two players or teams may have a conflicting desire, i.e. to win, but we all know that only one of them can do so. The conflict in this case is highly organised, there is a set of very strict rules that both sides adhere to and it becomes something that we enjoy watching and doing. It seems that only when we don’t agree on the rules, we run into trouble, and in the heat of the moment it can be hard for the players on either side to come up with a fair solution since their desire to win may be overriding their desire for fair game. Within themselves, these desires compete, and we are grateful for the referee who makes hard decisions. Away from the pitch, most players will agree that referees are necessary to make the game possible, but they may not always behave that way on the pitch under the high pressure. I find that workshops such as the ones organised by the FFA are a great time at which to reflect how emotions, culture and conflicting values and ‘rules’ may influence our own ability to deal with conflict. It is a place where peers who work in different countries but who deal with similar situations, can discuss what are the moments in their working life in which conflict and misunderstanding occur. 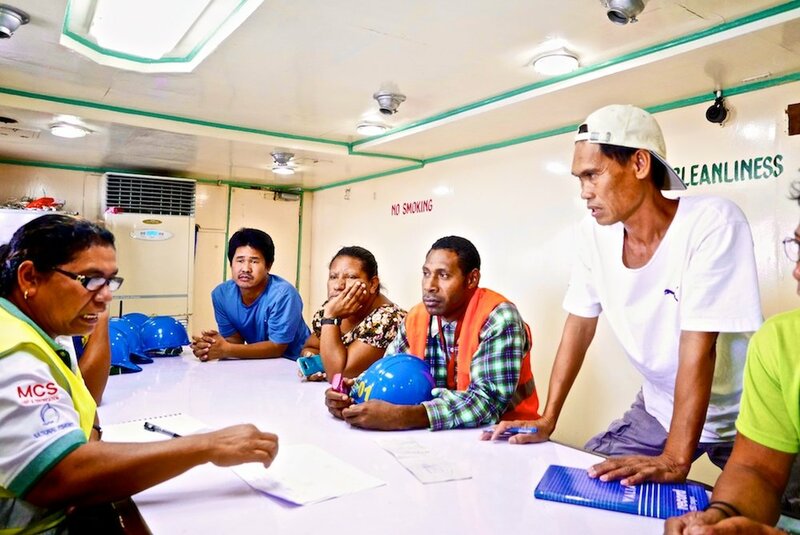 For example (unsurprisingly), fisheries inspectors have to step into situations where the other party may not be very welcoming as a lot is at stake for fishermen and fish processing factories when there are issues with compliance. Language barriers are an obvious problem, but this is often only the first thing to overcome. The world of fisheries is by its very nature, one in which different cultures meet, trade and interact as we go on the water and cross our oceans to feed people and make a living. As fishing becomes more industrial and international, legal and trade regulations become increasingly complex. Fisheries involve people from different countries and from different cultural backgrounds who live and work together on a daily basis. Language is of course a big part of culture and one that is not only expressed through the spoken or written word. We discover how our body language can be very expressive as well as can be a huge source of confusion and when misunderstood, can be a source of conflict. Feeling respected or not respected may be the simple reason why information does or doesn’t get shared and this can be a great problem for authorities and workplaces. It is very helpful to discuss what is ‘respectful’ behaviour in different parts of the world. We know for example that looking someone in the eye while they speak may be a mark of respect and attention in one place, but very disrespectful and seen as aggressive in the other. In the workshop we discuss a lot of ways in which cultures differ, like our understanding of time, of individual choice or collective decision-making, what constitutes authority, and gender roles. If we can make the time to discuss what it is like ‘back home’, we often increase our understanding of why the other acts the way they do. It is hard to resolve a difference in values, but it is possible to find mutual respect for the fact that we all hold values and an understanding that these will inform our actions. It is said that culture is like the water the fish swim in. As a fish, you don’t notice it, until you are not in the water anymore. Then you realise it is hard to breathe and you don’t know how to do the simplest things. It helps to realise that outside of our own culture, we are all a little lost and we need to work that much harder to uncover each other’s true intentions. Working harder in this case means asking some questions, being genuinely curious and listening carefully. This takes courage and time, but all those things are great leadership qualities. A major part of the workshop is working out what our own approaches to conflict are, and how our personal and emotional reflexes may translate to the professional setting. Through discussing different reactions to conflict, from avoiding and accommodating, to negotiating, competing and fighting, we realise that in fact we employ a variety of strategies to deal with thorny issues. This is based on the Thomas-Killman model of conflict modes. Everyone has an instinctive reaction to situations in which we feel threatened or attacked. We may want to run and hide or we may want to fight and dominate. Either way it seems that someone or something loses. How we react may be informed by how we grew up, and what expectations were placed on us according to our gender or status. Relating back to the previous example of the sports game, we are also conditioned to think in terms of winning or losing. Having a competitive person working for you may seem like an advantage for workplaces in a competitive business world. If that competition however turns on members of your own organisation, it can cause destructive conflict, as trust is eroded through aggressive behaviour, information does not get shared and workplaces lose money, time and people when workplace conflict becomes destructive. A fascinating aspect of the avoiding and accommodating styles of reaction to conflict is that these too have a destructive impact. It may be very destructive to the avoider for example, as they compromise their ability to do their own job, to raise important issues and it can even affect their health and self respect. The ultimate and least destructive way to deal with conflict is collaboration, and this often requires a very important switch in perspective. From the aforementioned sports game, where it is clear that only one side can win, in a workplace the best outcome is usually the one where everyone gets what they needs. In the world of fisheries inspection it is clear that regulating authorities and the fishing industry often have competing missions, but underlying that is a shared need for clear rules and a healthy ocean with a sustainable resource. Both parties want to see a fishing stock not just for today but also for the future as a way to make a living for the people of their country and survival of their companies. Decisions in business may be informed by economics and financial reality, but there is an underlying need to provide for people and to do so in relative harmony and stability. This is often a prime need that businesses share with regulating authorities. Collaboration is therefore the most sustainable way forward to deal with conflict both within a workplace, and on the coalface of enforcement and regulation. Sharing information and listening to the needs of the other party will smooth the way to collaboration. One of the most important skills we therefore practice in the workshop is listening. I teach that the best way to deal with conflict, or to avoid conflict becoming destructive is to learn to postpone judgment, even for a little while and to listen for any information that may be new to you, before you make decisions. In the workshop we go back to basics and practice how to listen ‘actively’ to others. We first practice it in a situation where there is no conflict; we simply share information and ask the listeners to repeat back the information that they have just heard, before they say their own piece. So often we are busy deciding what we are going to say, that we forget to listen carefully enough to be able to repeat back what the other person had just said. This may seem like a trivial exercise but I find that even for the most accomplished people it can be extremely challenging to reflect back what they had heard someone else say. Interestingly enough, as a mediator, listening and reflecting back what someone said is one of our main tools to help resolve a conflict. Hearing someone acknowledge in detail what you have just tried to express and perhaps have been saying for many years can truly help you move on from entrenched positions in very longstanding conflict situations. So even the simple exercise of repeating back the information that someone has just given you can help you steer away from conflict before it even happens. The key is to make it an opportunity for the person you are listening to, to clarify if you had indeed understood what they were trying to say and to invite them to add anything else. With asking that open question of whether there is anything else they need to add, you are likely to find out information you had not thought of before and it may help you make a more considered decision. In the heat of the moment, sadly it is only human to make snap judgments based on assumptions. When you are under direct physical threat this may be your best survival strategy of course, and we are biologically wired to react to threats. Most of the time in our workplaces, we are not under a direct physical threat, but our brains may momentarily tell us otherwise, so we do the opposite of what is needed and we stop listening and become caught up in emotion. Participants in the FFA workshop do discuss situations in which they feel physically unsafe and they come up together with strategies to diffuse tension or avoid these from happening. It could be something as simple as providing back-up to each other and retreating out of unsafe situations. There is a big role to play for the organisations in question to ensure that fisheries inspectors and observers can work safely, in terms of providing the legal and practical means for enforcing the ability to do so. New technology often provides an opportunity to come up with safer ways of gathering data; this may be considered as a way of surveillance that is both smart and safe for the fisheries inspectors. As a mediator from New Zealand it is not my expertise, but I believe that discussions between participants can inform structural and institutional changes. Even if I give ‘avoiding’ conflict behaviour a bad rap it is important to remember that there are ways in which workplace managers and leadership can prevent conflict from escalating to the point where it is costly to their organisations and their employees. To be able to do this, again, listening is an important skill. When a conflict situation comes up time and time again, it may be useful to review what can be done structurally in an organisation to have better communication and protect employees from recurring stress. If managers and leadership are willing to listen to the reality and grouses of their workers they can design their systems in a way that conflict is minimised. One example that was mentioned in the workshop was that of a competent worker who was being tasked with a lot of jobs, but who was at the same time, getting instructions from several managers and not getting support from co-workers. The problem was that there was no proper system to share the workload. A systematic approach to avoiding conflict therefore may be ensuring regular meetings to check off tasks as well as provide an opportunity to then decide whether some of the work can be shared. This avoids resentment, precludes conflict and increases collaboration. Like in any industry, the fisheries industry is one where conflict happens and it is a daily task for those working in it to manage it well. I applaud FFA for putting conflict resolution skills on the menu for workshop participants. It is a huge privilege to work with diverse groups as these and seeing the personal courage, wealth and depth of leadership skills within this industry in the Pacific.